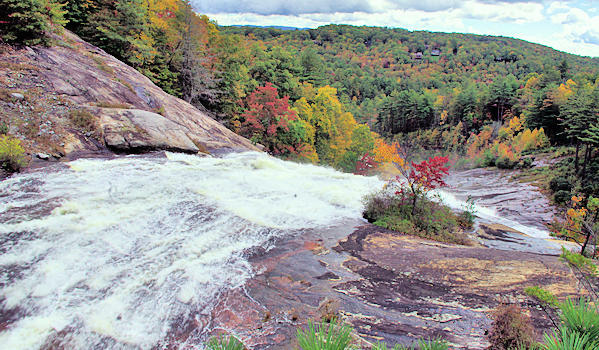 Many travelers drive across the top of the 150-foot Toxaway Falls and don't even realize it is there! Located on US Highway 64 west of Brevard at Lake Toxaway, you'll cross a bridge below the dam for the lake. There are spots to park on the westbound side of the road. Then cross the road for a walkway along the bridge for a view from the top of the cascading water. These photos were taken after a good rain, so normally the water flow is less. From the bridge, enjoy a view into Gorges State Park and the multi-colored rock slope where the water flows. It's a nice stop along the very curvy and scenic Highway 64 drive toward Cashiers and Highlands. View from the walkway on the highway bridge. It has an interesting history. 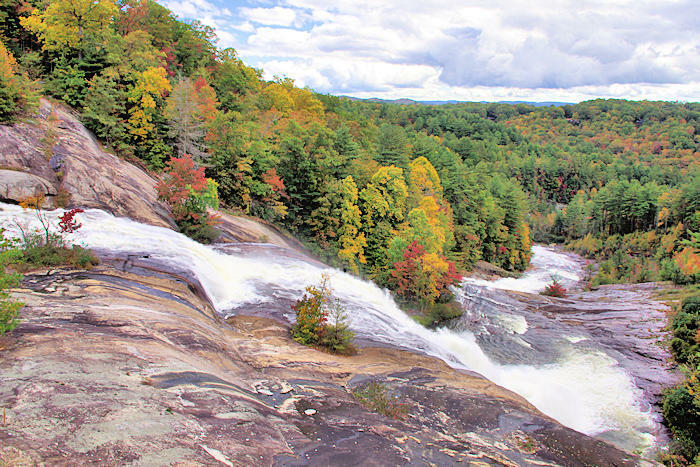 In 1916 after a 24-inch rain, the earthen dam collapsed and most of the water from Lake Toxaway rushed down the gorge, stripping away the vegetation and exposing the bedrock. The dam wasn't rebuilt until 1960. Read more about Lake Toxaway. 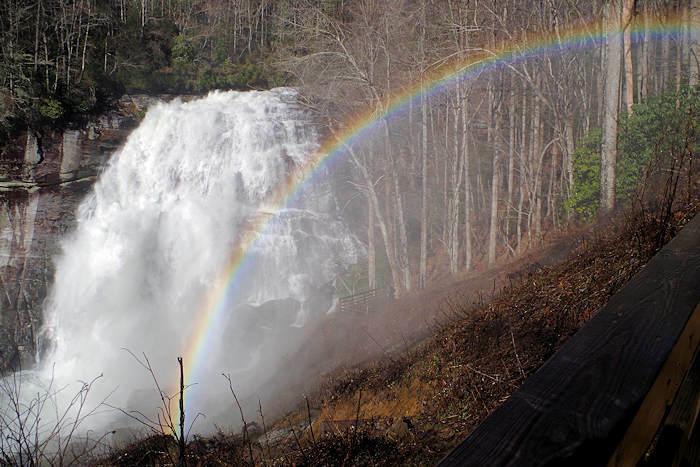 From downtown Brevard, Toxaway Falls is 16 miles west from downtown. Continue 13 miles west to Cashiers. Look for a large masonry bridge at the base of a hill and the dam to the left. Cross the bridge and park in the graveled area on the left side. Carefully cross US 64 to glimpse the falls on the south side. Just three miles away is Gorges State Park, home to Rainbow Falls and Turtleback Falls. About eight miles away is the east entrance to Panthertown Valley with the hike to Schoolhouse Falls and others. 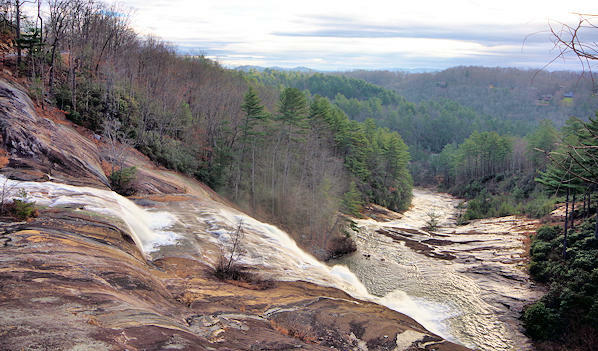 About 11 miles away is Whitewater Falls. 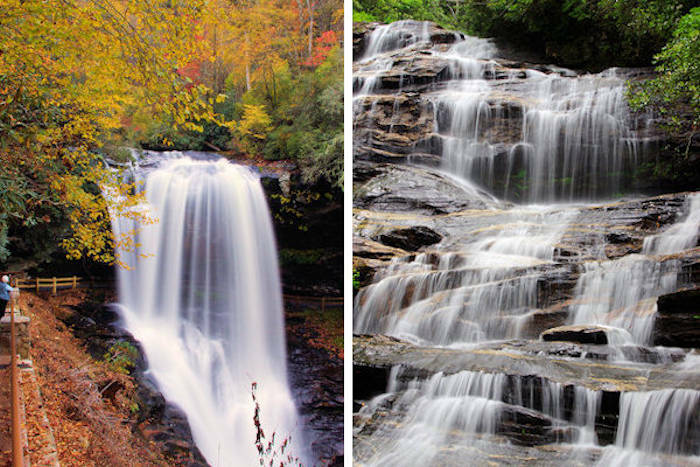 See more waterfalls near Cashiers and Highlands near US 64. It's a great waterfall to easily to enjoy during winter months. Find other roadside waterfalls. Also see Waterfall Drives & Maps.